Similar to Chili Palmer, shylock for the mob, coming to Hollywood to make his filmmaking dreams come true, it's Vampi who's thrust into the limelight. Captured on social media, Vampi becomes an instant viral sensation catching the eye of an aggressive talent agent. She also catches the eye of a mysterious dark force in the form of a woman named Slade. In this issue, Juliette, her agent, offers her a chance to become the next 'Elvira, Mistress of the Dark' essentially with potential hosting duties of horror films. Her first official public appearance takes place at a comic convention of all places. Plenty of humor is drawn from the state of cons and how they're more about TV and films than comics these days. Leth brings a fresh and funny approach to Vampirella that's subversive and light mixed with the horror you expect. The dialogue is especially snappy, snarky, and smart. The chemistry with her werewolf boyfriend and butler are a constant delight. Things at the Con go awry of course and we realize there's a lot more at stake and there is a legitimate danger. 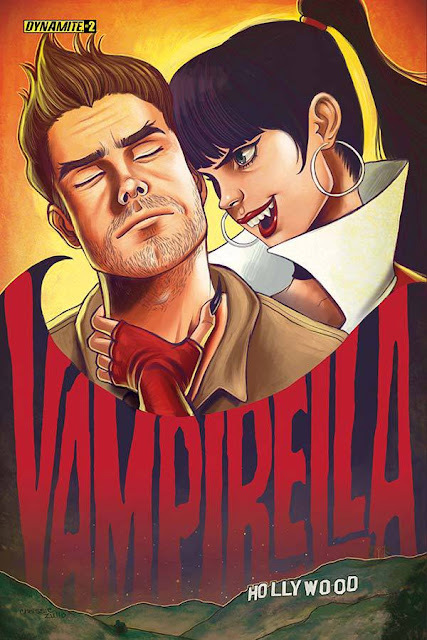 Juliette begins to understand that Vampirella isn't just an eccentric goth girl with a vampire fetish, she's the real thing. Her awakening to that fact is amusing and seems to be bringing her into the fold giving her a little more depth. This world Leth is creating is still evolving but it feels to be growing organically without forcing the narrative or the action. Eman Casallos and Valentina Pinto bring a lot of detail and color to this much brighter version (as compared to previous volumes) of Vampirella and the layouts keep the energy up even when there's no action. 'Vampirella' under Leth has taken on a mysterious and comedic turn with its horror legacy still in intact. Casallos and Pinta help bring it all to life with dynamic art and layouts. If you like your horror-comedy that's fun, well-written, and illustrated with bravado then this is the comic for you.